Hark! Do my eyes deceive me? Is it true? Could It possibly be even remotely true that JMS is off of Wonder Woman (and Superman) as of the last issue? OH YES, IT IS. Happy early birthday TO ME! Good: JMS’ completely misguided paws are off of one of my favorite heroes. Bad: His plot line is still going forward, but with a new writer. Good: His run only lasted all of four and a half issues. Bad: I have no idea who this “Phil Hester” guy is. Good: Ummm … did I mention that JMS is off of Wonder Woman? Yeah? Bad: I’m considering the possibility that this unplanned change could potentially be even more detrimental to the Wonder Woman title, and raises a slew of new questions. How long will Phil Hester be on the book? 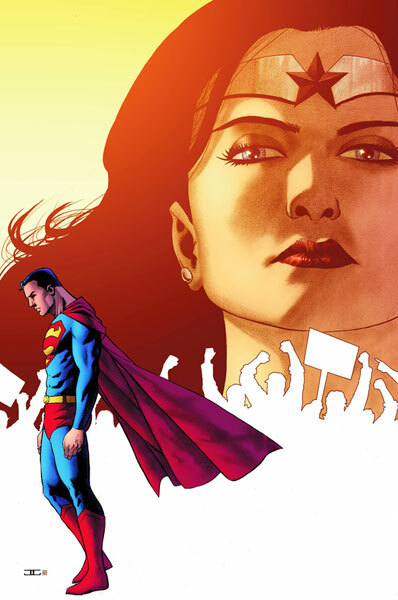 Who will take over next once this abysmal plotline ends, and what will he or she have planned for Diana? The news only serves to further the chronic instability of the title, which is not a good thing neither story-wise nor sales-wise. Conclusion: JMS is off of Wonder Woman. That means there’s hope. And this fangirl is happy enough with that for now. This entry was posted on 11/13/2010 by ravenhaired. It was filed under Awesomeness, Comic books and was tagged with DC, J. Michael Straczynski, Superman, Wonder Woman. Well my hopes that this wonder woman was separate from the main DCU may be dashed. Justice League 99 issue 1 was released last week and she’s in it wearing the new duds with the team. And yes…what the hell is Justice League 99? That dropped out of nowhere. I thought it was Justice League VERSUS the 99? No?